If you’re looking for a classic children’s toy that your kids will love, there’s no toy more traditional and entertaining than the activity cube. Challenging, engaging, vibrant and capable of providing hours of fun day after day, if your child doesn’t already have an activity cube, there’s never been a better time to get one. As your children grow older, they need toys that are more mentally and visually stimulating to match their developing brains, allowing them to experiment with various activities while improving hand-eye coordination. As you may or may not know, an activity cube is a toy that can provide all this and more. With improved motor skills from a young age, you can be sure you’re giving your child the best start in life. But the question remains - what is the best activity cube for your child? Search online and you’ll find over 1 million results, so how can you be sure you’re buying the best? Giving you everything you need to know, I’ve compiled my personalized list consisting of my favorite activity cubes that are available on today’s market. I have also included my comprehensive buying guide, detailing all the information you need to make the best purchasing decision for your child. Save money and time with these fantastic activity cubes that your children are going to love. Are you ready to give your children the best start in life regarding their entertainment and development? Here is my list of favorite activity cubes that they’ll never want to put down. To start my list, I’ve chosen one of the most popular and fully-featured activity cubes available today. Despite being one of the most affordable activity cubes, I think a more appropriate name would be an activity hub. 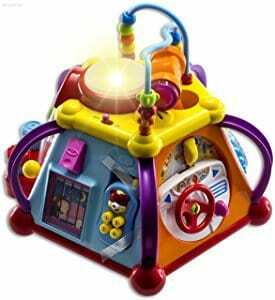 This free-standing center contains a complete range of activities that will captivate your children for hours. 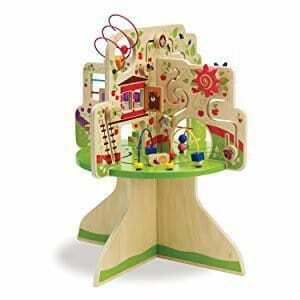 The solid wood design ensures this toy is extremely durable, designed to last for many years to come. The wood has been expertly crafted into a colorful and vibrant tree theme which suits any nursery or play room. Throughout the tree, your child will be able to explore a collection of spinners, flickers and other highly interactive pieces that guarantee to promote laughs, smiles and adventurous activity. There’s also a wealth of shaped toys, ladders and animal toys to play with. What's Great About It: When you’re buying a children’s toy, you want a quality toy that will last the test of time. This high-quality toy has been created by the leading Manhattan Toy company, a business that has over 30 years' worth of experience in the industry, leaving you safe in the knowledge that you’re buying one of the best cubes. Scaling down to a more portable activity cube, the WolVol Play Center adds an enjoyable touch of technology to create this outstanding cube. Priding itself on its stable and secure build, your child will be able to enjoy a comprehensive collection of fun mini games that always result in endless hours of fun. 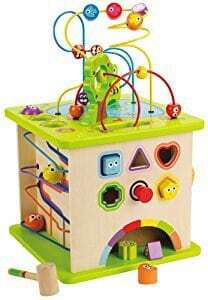 On each side of the cube, your kids can explore a variety of spinners, buttons, beads, gliders, flickers, switches and touch pads that make this one of the most interactive cubes on the market. Each feature has its own unique function that your child can learn to play and love. There’s a selection of integrated features, such as driving games, a cell phone and variety of tools that encourage singing and dancing. Each function comes with its own sound effects and light patterns which boost the engagement levels, helping you to effortlessly captivate and entertain your child as they develop their motor skills. What's Great About It: As parents, we all know that children can quickly become hyperactive and don't want to go to sleep. With this in mind, the WolVol Play Center comes with calming music and games, so when it’s getting towards bedtime, you can simply encourage your children to play these games which will help them wind down. Suitable for children aged 2 and above, the Anatex Play Cube is a highly portable cube that your children can take with them wherever they go, meaning they can enjoy hours of fun, no matter where they are. The cube prides itself on five highly interactive sides, each one with its own collection of mini-games and puzzles that will stimulate your child’s mind and problem-solving abilities. 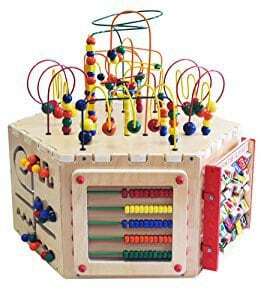 The top of the cube has a collection of bead gliders that adds to the already outstanding levels of entertainment. This award-winning cube comes with a variety of games including Pathfinders, abacuses, turning gears and alphabet cubes, perfect for combining playtime with learning time which can dramatically increase your child’s intelligence levels. To add some perspective, this activity cube is self-marketed as the ‘ultimate sensory experience’, and boasts a variety of stimulating colors and visuals, perfect for captivating your child's mind. What's Great About It: Despite being packed with so many different features, as the title suggests this is the mini version of the activity cube, meaning your child can take it anywhere with them. Whether you’re out and about, at home or in the car, this cube will quickly become your child’s favorite travel companion. It goes without saying that kids love playing with animal friends. This is why Hape Country Critters is designed around the exciting Country Critters theme. If you’re looking to inspire and encourage high levels of imagination, this is the cube for you. Suitable for children from the ages of 12 months and above, each side of this highly portable cube comes with a complete collection of mini games, from fitting animal friends into their respective slots to hammering pieces into the top of the cube and watching them roll down a variety of gliders to the bottom. 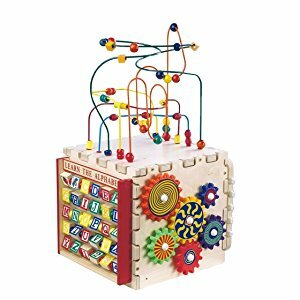 All in all, there are ten unique pieces that can interact with different games around the cube and there’s a collection of bead gliders and rails on the top, proven to be one of the most popular children’s games of all time. Regarding the cube, the colors are vibrant and engaging, and all artwork and visuals have been finished to the highest quality, while remaining toxin-free and completely safe for your child. What's Great About It: One of the leading features of this activity cube is the outstanding quality of the build. You don't want to buy a cube that breaks after a couple of uses, which is why Hape has opted for a stable and solid wooden build that is designed to last for years, even with consistent daily use. One of the most common problems toy makers and parents face is children becoming bored with their toys quickly. To eliminate this concern, Anatex has created the exciting feature-packed six-sided activity cube that your children will adore for years to come. Specifically designed for children aged three and above, there are seven highly interactive sides for your children to play with, six around the outside and the traditional yet highly engaging bead rails and guides on the top. In total, you’ll find seven stimulating games for your child to play with. Around each side, you’ll find pathfinders, roller coaster bead mazes, magnetic games, zig-zag panels, alphabet cubes and math abacuses. As you can see, these are all highly stimulating games that are designed to maximize entertainment while mentally engaging your child’s mind to learn essential development skills that aim to give them a head start in life. What's Great About It: The leading feature of this outstanding activity cube is how child-friendly it is. We constantly hear stories of children swallowing small pieces, and it’s a horror story that no parent wants to go through. The Anatex cube is designed to be self-contained, so there’s no risk of your child accidentally swallowing small pieces. Now that you’re knowledgeable about some of the best activity cubes that are currently available in today’s market, it’s time to choose which one is best for you. Use my comprehensive buying guide below to know exactly what features you should be considering while shopping. As with any child-friendly toy, the main aspect you’ll want to consider is safety. When it comes to activity cubes, the main concern is small pieces, such as beads, that could be accidentally swallowed which, in the worst case, could prove fatal. Always make sure you check the recommended guidelines on the product descriptions to ensure that your child is suitable for the cube that you intend to buy. If your child especially loves to put toys in their mouth and this is a serious concern to you, it’s highly recommended that you choose a completely self-contained activity cube that has no loose parts. As you would expect, the leading feature of any activity cube is the number of games that it provides. As a cube, the minimum you’ll want is five games, one of each side and something on the top. As you can see from my list, there are multiple ‘cubes’ that can provide up to seven different games. The more games your cube has, the less likely your child is to get bored, allowing them to get a great deal of enjoyment from their toy. One of the main draws parents have to activity cubes is their ability to educate your child while they play. If this is something you want from your cube, it’s highly recommended that you look for educational fun mini games, such as simple math puzzles or alphabet cubes. These will help to educate your children in the essential skills needed to get them through life. If you and your child are constantly on the move, such as to school, the doctors, friend’s houses and the shops, you’ll want a portable cube that they can play with while on the go. There are two main types of activity cube. The first is freestanding, such as the first cube on my list. These are usually relatively heavy and wouldn’t be suitable for car journeys, and are perfect for home use. The second type is cubes that are designed to be portable, such as the third cube on my list. This is completely up to your specifications. Just remember to always check the size and weight of the product before you buy it. You don’t want to buy an activity cube for your child that breaks after just a couple of uses due to it being a poor-quality build. As a rule of thumb, the cheaper the product, and the cheaper the materials, the more likely it is to break. Instead of continuously paying for a new cube, it is in your best interest to pay a little bit more money for a cube that is built to last. With so many developmental and educational benefits, activity cubes are quickly becoming a must for any modern-day parent. By introducing a cube to your child from a young age, you are boosting the levels of entertainment that they can have when at home while simultaneously giving them a head start when it comes to their ability to learn. Before you buy, consider exactly what it is you want from an activity cube so you can find the one that is perfectly suited for you.